Amongst my numerous hobbies, I have taken an interest in video game modding. It's nothing major--I'm no programmer--but certain games I enjoy do produce easy-to-use modding tools and I've taken advantage of those to produce my mods. While some modders mod in extra stories or greater challenges for the players and others use their skills with art of music to increase a game's aesthetic appeal, my approach is less discerning: I cheat. I make mods that unashamedly increase the player's power, granting them game-breaking skills and abilities otherwise render the 'traditional' challenge of the games moot. So bear that in mind before using any of the powerful instruments of duplicity outlined below. 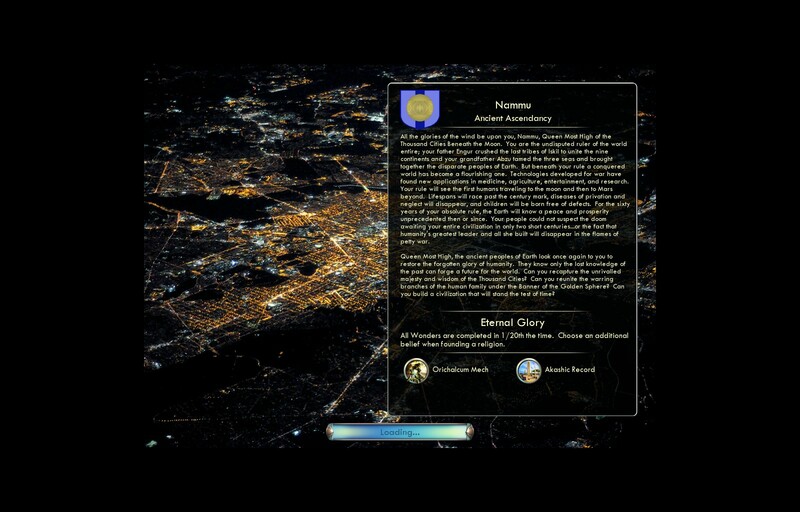 A unique super-culture possessed of advanced technology and game-breaking advantages. New Leader: Play as Nammu, Queen Most High of the Ancients. Due to my lack of artistic ability, the part of Nammu will be played by Dido of Carthage (or Wu Zetian of China in the Vanilla version). New Trait: Eternal Memory - Build all Wonders in 1/20th the time. 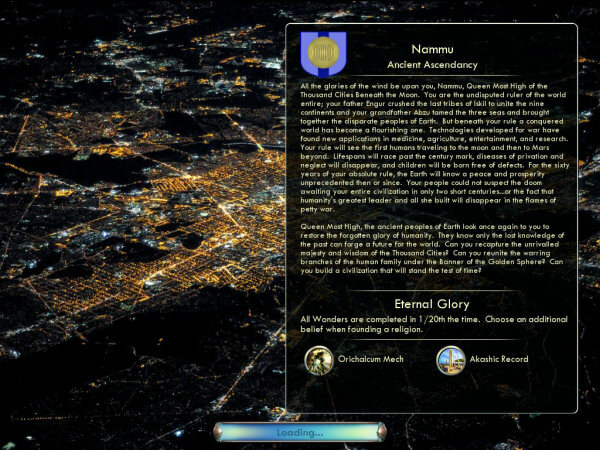 Additionally, the superior spirituality of the Ancients allows you to select an additional belief when founding a religion (in all versions other than Vanilla). New Unit: Orichalcum Mech - The pinnacle of Ancient military technology, this replacement for the Giant Death Robot has all that unit's strengths and none of its weaknesses. Defend and assault cities without fear! 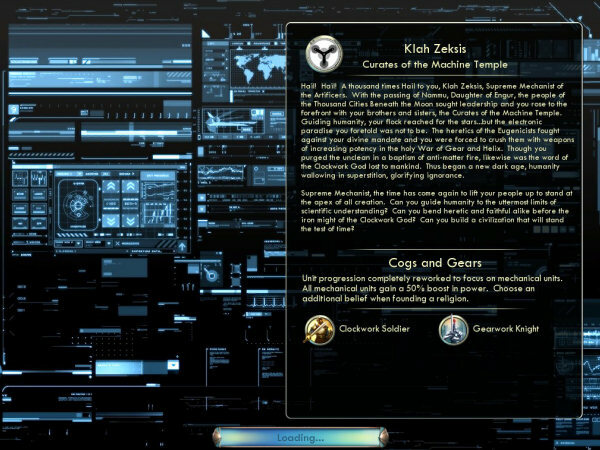 New Building: Akashic Record - The cornerstone of every Ancient city, this replacement for the Monument provides an early-game boost with a +3 to food, happiness, production, gold, faith, culture, and science. A unique super-culture possessed of superior mechanical technology and game-breaking advantages. 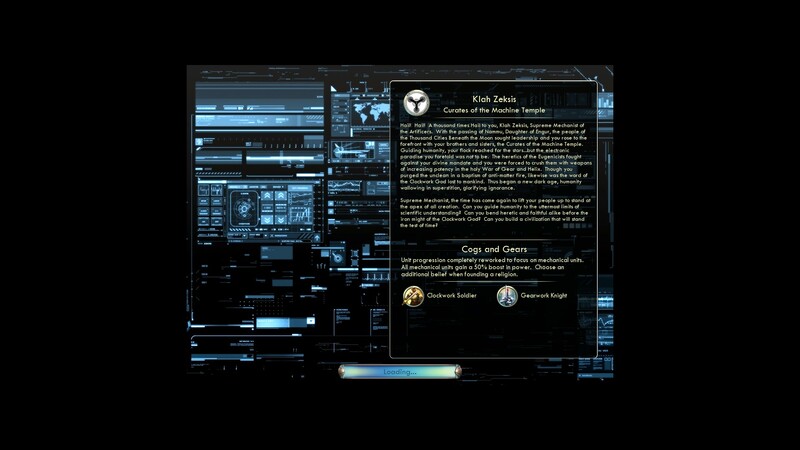 New Leader: Play as Klah Zeksis, Supreme Mechanist of the Artificers. Due to my lack of artistic ability, the part of Klah Zeksis will be played by Bismarck of Germany. New Trait: Cogs and Gears - Unit progression has been completely reworked to focus on mechanical units, Mechanical units are now 50% stronger than normal. Additionally, the superior spirituality of the Artificers allows you to select an additional belief when founding a religion. New Units: Land Ironclads, Landships, Land Leviathans, Airships, Steam Flyers, Sky Fortresses, Battering Rams, Ballista, Hwach'a, and more all make an appearance as new units available to the Artificers. Additionally, all normal mechanical units have received a 50% boost in power. New Building: Machine Temple - The cornerstone of every Factory-City, this replacement for the Shrine provides an early-game boost with a +4 to faith, growth, production, and science. It also promotes faster generation of Great Engineers. 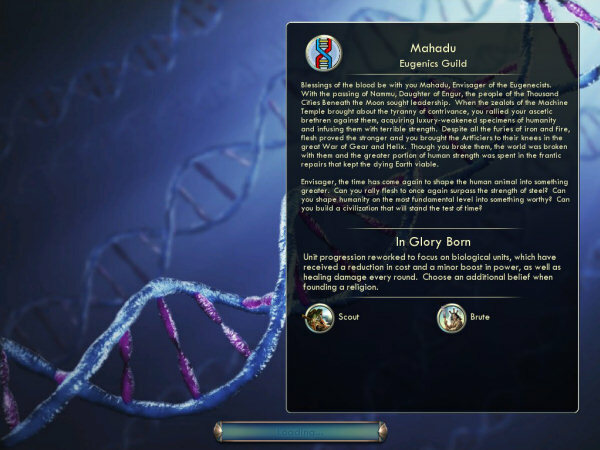 New Leader: Play as Mahadu, Envisager of the Eugenecists. Due to my lack of artistic ability, the part of Mahadu will be played by Haile Selassie of Ethiopia. 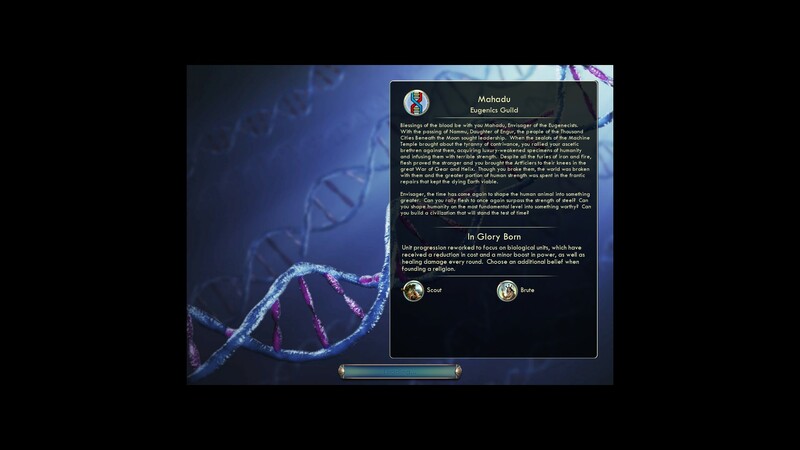 New Trait: In Glory Born - Unit progression reworked to focus on biological units, which have received a reduction in cost and a minor boost in power, as well as healing damage every round. Choose an additional belief when founding a religion. New Units: Almost all mechanical units have been excised from the Eugenicist unit tree (except for naval units and missiles), instead replaced with a unique advancement scheme filled with repurposed human and mounted units. New Building: Creche - The cornerstone of every Eugenecist city, this replacement for the Granary provides a major boost to food generation and a smaller boost to happiness, production, culture, and science. It also promotes the production of Great People.